DEVELOPMENT AND FUNCTION OF THE CONNECTIVE TISSUE: As the name implies, connective tissue joins other tissues of the body together. It connects muscles to bones and gives strength to tendons and ligaments; it consists for the most part of elastic fibers. A layer of loose connective tissue containing fat cells lies directly underneath the skin (subcutaneous). Next to providing structural support, connective tissue aids in tissue repair by forming fibrous scar tissue (during PCL-B). Neuroglia is a specialized form of connective tissue that assists healing processes in the brain. 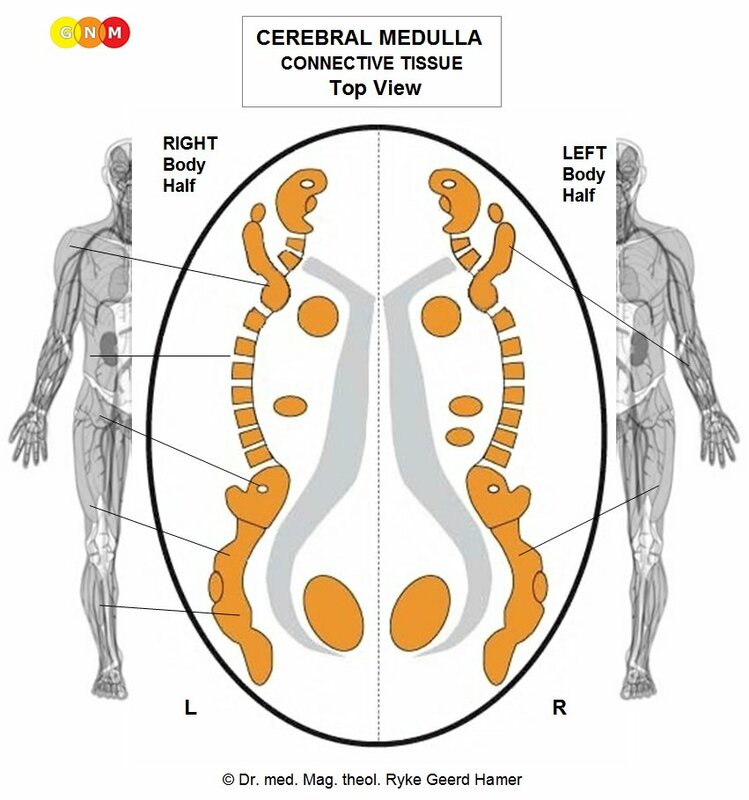 Connective tissue derives from the new mesoderm and is therefore controlled from the cerebral medulla. NOTE: Like the connective tissue, neuroglia is also of new mesodermal origin. 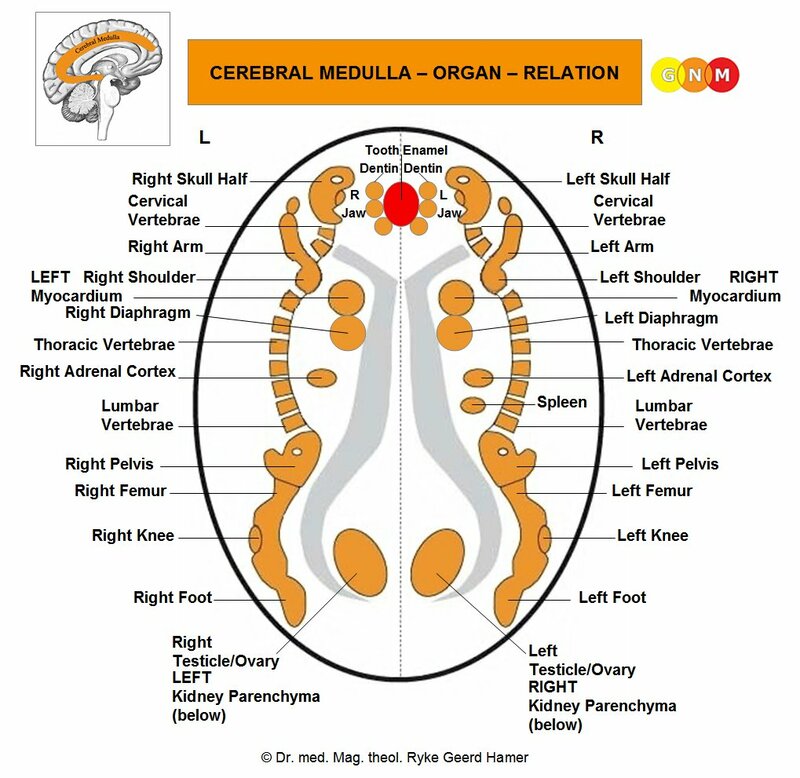 BRAIN LEVEL: In the cerebral medulla, the connective tissue of the right side of the body is controlled from the left side of the brain; the connective tissue of the left side is controlled from the right cerebral hemisphere. Hence, there is a cross-over correlation from the brain to the organ. NOTE: The bones, skeletal muscles, lymph vessels with lymph nodes, blood vessels, connective tissue, and fat tissue share the same brain relays and therefore the same biological conflict, namely a self-devaluation conflict. The control centers are orderly positioned from head to toe. BIOLOGICAL CONFLICT: The biological conflict linked to the connective tissue is a light self-devaluation conflict or loss of self-worth. The specific self-devaluation conflicts are the same as for the bones and joints. In line with evolutionary reasoning, self-devaluation conflicts are the primary conflict theme associated with cerebral medulla-controlled organs deriving from the new mesoderm. NOTE: Whether the conflict affects the connective tissue of the right or left side of the body is determined by a person’s handedness and whether the conflict is mother/child or partner-related. A localized conflict affects the connective tissue that is closest to the site associated with the self-devaluation conflict. HEALING PHASE: During the first part of the healing phase (PCL-A) the tissue loss is replenished through cell proliferation with swelling due to the edema (fluid accumulation). With profuse cell growth, the swelling might be diagnosed as a connective tissue sarcoma, considered in conventional medicine as a “malignant” cancer (see also muscle sarcoma). However, if the rate of cell division is below a certain limit, then the growth is regarded as a “benign” tumor or fibroma (compare with neurofibroma related to the myelin sheath). A carbuncle or furuncle, also known as a boil, develops at the area of the body where the self-devaluation conflict was experienced, for example, on the forehead because of an intellectual self-devaluation conflict. The abscess originates in the connective tissue layer underneath the skin. Often, a boil starts in a hair follicle, which reaches deep into the subcutaneous tissue. If bacteria such as staphylococcus bacteria assist healing, the painful growth becomes filled with pus, typically accompanied by an inflammation, termed carbunculosis, furunculosis or folliculitis. A carbuncle or furuncle could also originate in the corium skin; in this case, the related conflict is an attack or “feeling soiled” conflict. Keloids are an overgrowth of scar tissue at the site of a wound, for example, after burns. 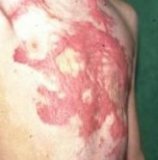 However, keloids also form as a consequence of long-lasting healing phases due to continuous conflict relapses, particularly during the scarification phase (PCL-B). The recurring repair leads to the thick, raised appearance characteristic of keloidal scars. Scleroderma (“hard skin”) is a condition in which the skin becomes thick and hard and loses its elasticity. It is the result of prolonged healing in the connective tissue layer underneath the skin. Scleroderma around the lips reveals that the self-devaluation conflict was associated with the mouth area similar to an oral conflict (see also scleroderma related to the epidermis). A thickening and tightening of the connective tissue of the palm and fingers is termed Dupuytren's contracture (the condition does not involve the tendons, as generally assumed). Symptoms include painful bumps (nodules) that develop into tough bands of tissue, causing the fingers to curl (compare with focal hand dystonia where the finger(s) curl into the palm due to sustained muscle contractions). A recurrence after surgery is an indication that the conflict has not been resolved. ... or a self-devaluation conflict related to driving (associated with shifting gears). 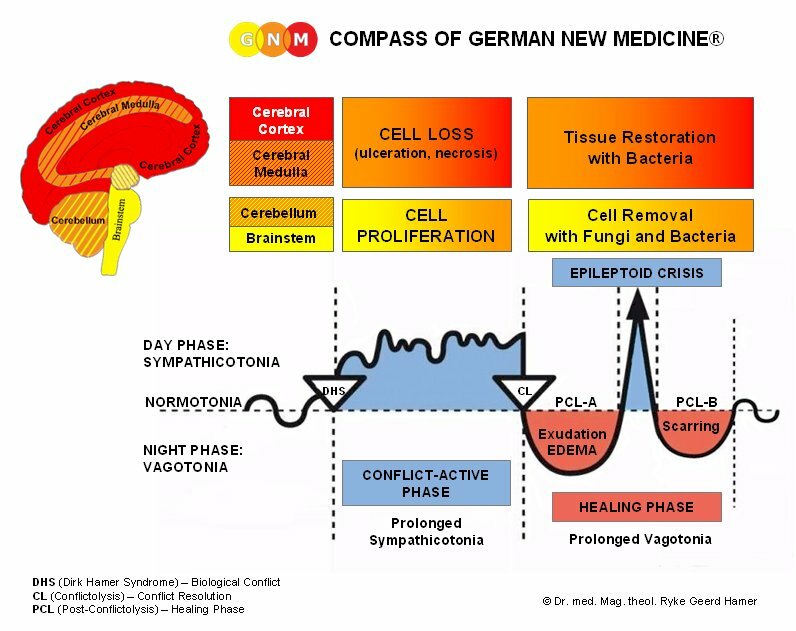 NOTE: All organs that derive from the new mesoderm (“surplus group”), including the connective tissue, show the biological purpose at the end of the healing phase. After the healing process has been completed, the organ or tissue is stronger than before, which allows being better prepared for a conflict of the same kind.